Guru Sharan ji – Guru Sharan, his first and middle name, and ji is something we add, out of respect after a person’s name in Nepal – used to be one of the many children supported by the Save the Children sponsorship program in the Siraha district of Nepal. Today, he works as an Accountability Officer, collecting feedback from community members about our programs and analyzing the effectiveness of those programs to ensure children are receiving the best health and education support possible. After seeing the benefits of sponsorship as a child firsthand through the programs run in his childhood community, he was inspired to be a part of that work and get involved with our organization as an adult. 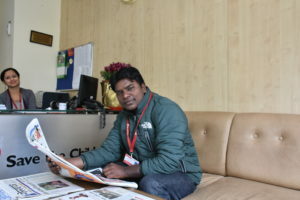 I immediately recognized him when I first saw him on the stairs of Save the Children’s Kathmandu office last year. It was a moment of satisfaction and tremendous joy for me to see him, a formerly sponsored child, doing so well in his grown-up life. Recently, I shared with him my happiness in seeing a story from him on a social networking site in Nepal. It featured him with his wife on the day she graduated from college. I asked him if he was the one who took it upon himself to advocate for her education since he actively participated in child rights programs as a sponsored child, for example through the child club in his school. We spoke of the cultural trends and restrictions in his community, where education was not considered an integral part of growing up. Parents instead focus on providing just two proper meals for their children a day, and do not have time to support their children’s studies. Girls’ education, in particular, is considered nothing but a waste of time and money. As a child his wife, Shanti, had dropped out of school prior to finishing 5th grade and then returned after attending non-formal classes run by Save the Children for out-of-school children. 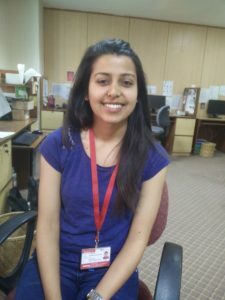 She feels as passionately about the importance of education for children as Guru Sharan ji does, and wants to pursue a postgraduate degree in teaching. How was your mother so accepting of the idea to send her daughter-in-law to school? How did she find the courage to go against the trending culture? Did she learn about children’s rights from you? I was curious and began asking him many questions. “When I look back, I realize that my mother was very receptive of progressive ideas. She was hearing from me and the sponsorship programs [staff] that education is every child’s right,” he shared. Today, formerly sponsored child Guru Sharan ji is happy to be continuing the great work that helped him so much as a child. As a child, Guru Sharan ji himself was very active in the child club run at his school through sponsorship, where with his peers he enjoyed discussing important issues that children face like child rights and the ill effects of child marriage or corporal punishment. He remembers the first day participating, being so nervous to speak in front of the group. After that, through the club he started to put a lot of his efforts into improving his public speaking skills. As he practiced through this forum, his skills improved to the point that he was often called out at various sponsorship supported functions and events to speak on behalf of the group. He began to realize that education was very important in one’s life. People would seek you out if you were educated. He would share these thoughts with his mother as well. Since he was the eldest child in the family, his mother would listen to him. All the changes she saw in her son made her proud and she knew all these changes were possible because of education and the sponsorship program. Sponsorship uses a holistic development approach directed towards children through programs in education, health, adolescent development and livelihoods skills. Amidst the programs is one key factor that determines the sustainability of these programs: behavior and attitude change. The movement of changing behaviors and attitudes from Guru Sharan ji, to his mother, and lastly for his wife’s benefit, is a prime example of how Save the Children creates sustainable solutions to the problems that children face in Nepal while also benefiting their whole community.